On Farooq Shaikh’s birthday, here are his best comic films. Much before Aamir Khan redefined the image of college students with his films such as Dil Chahta Hai (2003) and Rang De Basanti (2006), Sai Paranjpaye showed us how the real Delhi University students lived and loved in the 1981 hit comedy, Chashme Buddoor starring Farooq Shaikh. The actor, who would have turned 71 on Monday,never aspired for mainstream masala. Along with Amol Palekar, he came to stand for middle-of-the-road cinema which was honest and grounded. Born on March 25, 1948, Shaikh began his career in Bollywood with Garm Hava (1973), which he soon followed up with notable films like Shatranj Ke Khiladi (1977), Noorie (1979), Chashme Buddoor (1981) and Kissi Se Na Kehna (1983). He worked with legendary directors Satyajit Ray, Hrishikesh Mukherjee, Muzaffar Ali and Ketan Mehta among others. Farooq has also acted in many serials and shows on TV and performed on stage with Tumhari Amrita being just one shining example of his craft. He was honoured with the 2010 National Film Award for Best Supporting Actor for Lahore (2010). Though Farooq’s repertoire was vast and varied — he played a migrant worker to a nawab, an unemployed college graduate to a man in love with a woman who is sold off — he was first and foremost an Everyman. It was his image that brought an extra charm to his performance in comedies. 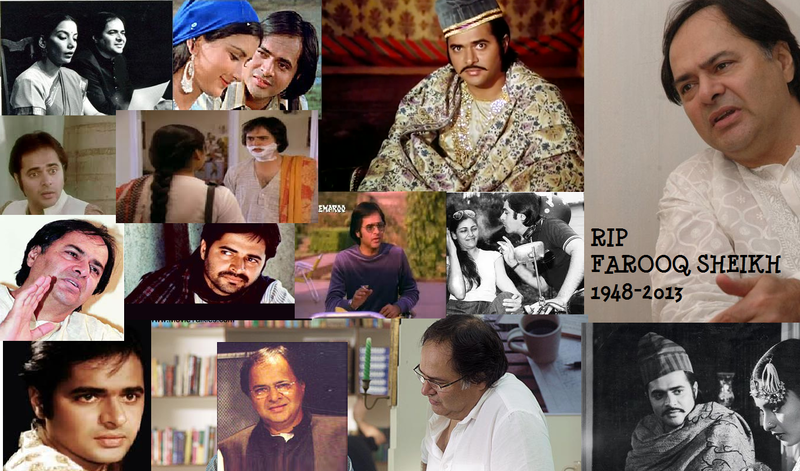 On the 71st birth anniversary of Farooq, here are films that prove he had perhaps the best comic timings in the industry. Before Dil Chahta Hai (2003) and Rang De Basanti (2006), there was Chashme Buddoor where Shaikh played a shy and studious Siddharth Parashar whose restraint made for the perfect foil to his friends Omi and Jomo’s boisterousness (Rakesh Bedi and Ravi Baswani). The film was about three college friends, how they fall for the same girl and the one who tries the least, gets the girl. A Hrishikesh Mukherjee film, it had the hit pair Farooq Shaikh and Deepti Naval in the lead. While Deepti played the highly educated Dr. Ramola Sharma, Farooq played a young man struggling to balance modernity and his father’s insistence on traditions. The 1983 film was loosely based on the 1976 Bengali movie, Mohunbaganer Meye. This Rekha-starrer film marked Salman Khan’s onscreen debut and showcased Farooq as the obedient son of an extremely disciplinarian mom (Bindu). However, her control over the household is challenged when Farooq decides to marry Rekha, a woman from a village. Farooq’s innocence adds to the fun in this 1988 film . Hrishikesh Mukherjee’s comedy had Farooq Shaikh as a professor whose girlfriend, played by Deepti Naval, gets involved in the life of her boss Amol Palekar and his wife. The film had Utpal Dutt in his elements as a cop.